The doctor was riding home from the medical clinic where he worked, through the bustling streets of Guangzhou, when a truck swerved suddenly and cut him off. As the truck screeched to a halt in front of him, the doctor got off his motorcycle and walked towards it. The truck driver, agitated, opened the door and, grabbing hold of the truck's roof, kicked out at the approaching doctor. The doctor reacted quickly and, turning his stance, struck deeply into the soft tissue below the kicking driver's knee with a powerful palm-edge. The driver cringed but had already launched his other leg. The doctor simply turned again and applied a second palm-edge. The driver screamed and, losing his grip, fell from the truck. Just at the doctor was about to leave, however, a second man appeared suddenly from the side, swinging his arm, a long-bladed knife clutched reverse-grip in his hand. Seeing the attack out of the corner of his eye, the doctor shot out his arms in a half-dispersing-wing movement to cover. He intercepted the attack but the blade was long enough that it's tip still managed to bite slightly into his chest. Following up immediately, the doctor yanked the knife-wielding assailant off balance and struck out simultaneously with a devastating tiger-tail kick. A crunching sound accompanied the attacker's scream. The doctor, grandmaster Sum Nung, watched the man turn and limp away, clutching his shattered side, before returning to his motorcycle and continuing on his way home. 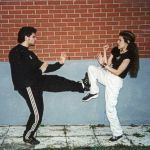 While wing chun kuen is well know for its simple, effective boxing methods, what has often been overlooked is that wing chun kuen also contains a multitude of devastatingly effective kicking skills. 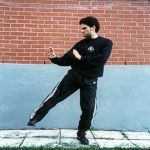 In fact, the very same principles that gave rise to wing chun kuen's reputation with the hands are just as effective when applied with the legs. The Sum Nung system of wing chun kuen was handed down from Fine Jade Flower Union (King Fa Wui Goon) Opera performers Wong Wah-Bo and Painted Face Kam (Dai Fa Min Kam) to Imperial constables Fok Bo-Chuen and Fung Siu-Ching and from them on to Yuen Kay-San of Foshan. Known as Yuen the Fifth (Yuen Lo Jap), he in turn passed his knowledge on to Sum Nung (Cen Neng), the present day grandmaster of the system, who had previously learned the san sik (seperate technique) wing chun kuen of Cheung Bo. The well rounded and effective kicking and counter kicking of the system stem from these many influences and from the rich heritage of the art. 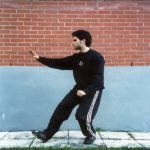 Wing chun kuen contains numerous kicking techniques. While each movement has its own unique aspects, there are several concepts that can be generally applied to all of them. Unlike some other martial arts, wing chun kuen kicks are never applied above the height of a practitioners own waist. Like most Southern fist systems, wing chun kuen prefers to use the legs to counter the legs and leaves higher level techniques to the upper body. In application, wing chun kuen kicks are used directly and explosively to break an opponent's structure and destroy their ability to continue an encounter. The power used in the kicks can vary from long and thrusting to short and whipping to pressing and controlling. Furthermore, there are no feints or fakes to confuse an opponent or measure distance. 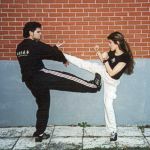 This is because, while powerful, kicking is also risky, as the lifting of the leg reduces stability and leaves the practitioner vulnerable to having their own balance broken. Thus, wing chun kuen does everything possible to ensure that when a practitioner kicks, that kick will not miss. 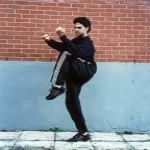 The heart piercing kick (chuen sum gerk) is the first kick introduced in the sinking bridge (chum kiu) set. The kick begins with a circling movement that can be used to evade an attack or to attain better positioning. In the set, the knee comes up with the foot outwardly rotated. This can be used to obstruct an incoming kick, or to lock or jar an opponent's leg. The leg then thrusts straight forward. Like the well known vertical punch of the system, the direct nature of the heart piercing kick allows it to intercept and counter in one motion. The technique itself can be used as a stop-kick, to strike into vulnerable areas of the opponent's anatomy, or to press and fold their joints. Following the kick, the leg can either return to its position of origin or can be used to step forward for a follow up. The side nailing kick (wang ding gerk) is also found in the sinking bridge set and is used, as the name suggests, to the practitioners side. Like the heart piercing kick, the side nailing kick also begins with a circling of the foot and raising of the knee to cover evasion, jamming, etc. from its own unique angle. 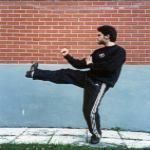 Because of the direction of the kick, positioning and angling play an important role and if done with proper timing, allow the practitioner to slip attacks while countering with a kick, stamp, sweep, or joint press, at the same time. The angling kick (gok ma), found in grandmaster Sum Nung's twelve forms (sup yee sik) set, strikes diagonally with either the toe, instep, or shin. A short, powerful motion, the angling kick is used to quickly chase and control a limb, trip an opponent, or strike deeply into sensitive anatomical areas. The tiger tail kick (fu mei gerk), included in the wooden dummy (muk yan jong) and air dummy (hong jong) sets, can be used from the side or the back. Its nature maximizes evasion and power and can be launched quickly from a standing position or when stepping to flank an opponent. In form, the upper body drops down quickly while the leg raises and strikes out with the body weight firmly behind. This allows it to strike at a longer range directly into an oncoming opponent. The moving kick (yee ma), which comes from the darting fingers (biu jee) set involves an outward arcing of the leg. It is typically used to destroy the body structure of an opponent by circling around their leg to fold or sweep it out from under them. The rising knee (hei sut), also found in the dummy set, looks similar to the initial chambering of the front and side kicks. It differs, however, in that it is not merely used for obstructing but actually strikes with the point of the knee itself. This makes it useful for offense at extremely close ranges. There are several elements important to the successful application of kicking. These elements include practice, timing, positioning, balance, targeting, and sensitivity. Practice makes perfect. An old saying but a true one. Each basic needs to be drilled over and over again until it becomes a natural, instinctual movement that will hold up under stress and pressure. The only true secret in any martial art, practice can be accomplished through solo drills, partner training (moving from set patterns to freestyle exchange), and on the wooden dummy. Timing is arguably the most important aspect of any technique and can only be built through hard work and experience. Without timing, every other aspect may be perfect and the kick could still fail. Some kickers use an active approach with a set, steady tempo. Wing chun kuen focuses instead on reaction and interruption, allowing a practitioner to intercept the pattern of such attacks and to strike while an opponent is most vulnerable; while still preparing, is caught midway through their motion, or is attempting to recover from a missed technique. Because of the relatively low height of wing chun kuen kicks, they require close proximity to the opponent in order to make them effective. Due to this closeness, kicks often operate within the same range as the hands and thus all the body's limbs can be used together, to support and complement each other. An opponent controlled by the hands is both easier to strike and to prevent from countering. Initial positioning, which uses a facing approach, allows a practitioner to attack or defend equally with any limb or any combination of limbs. In transition, wing chun kuen cuts the angles, charging or flanking to optimize the practitioner's options and attacking weapons while simultaneously minimizing those of the opponent. Balance requires a steady, stable root. When raising a leg to kick, it leaves only one leg for standing. To overcome this, wing chun kuen trains turning, moving, and kicking with the majority of the weight on one leg right from the beginning. In application, the opponent can become the second half of the balance equation, with a practitioner holding them and "borrowing" their stability during the kick. Through all of this, wing chun kuen's goal is to always destroy the opponent's ability to form an offense as quickly and efficiently as possible. Towards this goal, wing chun kuen targets the closet, most vulnerable part of the opponent's anatomy. Options from the inside can include joints like the ankle or knee and vital areas like the groin. From the outside, the joints, kidneys, and ribs are all available targets. Large muscle groups and other sensitive areas can also be struck or pressed from either angle. The exact target will, of course, depend on circumstances such as the opponent's timing, distancing and positioning, balance, etc. Sensitivity enables a practitioner to minimize reaction time when in the close proximity to the opponent wing chun kuen favors. At this range, the legs work much as the hands do in chi sao. By touching the leg and feeling for the subtle changes of angle and pressure, a wing chun kuen practitioner can adjust faster than eyesight alone would allow. The direct feedback received through maintaining such contact allows the practitioner to remain a step ahead of the opponent and to keep this advantage, disrupting as needed, throughout. Wing chun kuen is a conceptual, not a technical martial art. The techniques merely show the basic tools, the concepts allow those tools to come to life in application. Cleaving the center is the simplest most direct response to a kicking attack. If an opponent takes a circular route, or the wing chun kuen practitioner has the timing to intercept, a counter kick can take the shorter path, dominating the mutual meridian line, and thrust straight forward through the opponent's center. If the opponent's attack is already taking the center, the practitioner can step to face or flank, creating a new line to cleave through. Attacking the post targets the supporting leg of a kicking opponent. It takes advantage of their vulnerability in having all their weight resting on one leg by attacking the very limb that is keeping them standing. Attacking the weapon is similar to attacking the post, but targets the kicking leg rather than the supporting limb. Depending on the range and the timing, cleaving the center or attacking the post may not be a possibility. In these instances, the practitioner can attack the closet target and follow up from there. Obstructing the path, when not able to properly counter early or directly enough, allows a practitioner to jam the opponent's timing and choke off their attack before it becomes a threat. In addition to breaking the opponent's structure, the obstructing leg is also pre-positioned to allow for immediate follow up. Among the better known individuals fortunate enough to have learned from grandmaster Sum Nung (with apologies, far too many to list here completely) are Sum Jee, Leung Dai-Chiu, Ngo Lui-Kay (Ao Leiqi), Kwok Wan-Ping, Lee Chi-Yiu, Wong Wah, and many others. Ngo Lui-Kay followed grandmaster Sum Nung from the mid-1960s until he relocated to Canada in 1982. As the wing chun kuen kicking and counter-kicking was passed to grandmaster Sum Nung, and from grandmaster Sum Nung to Ngo Lui-Kay and his many classmates, so have Ngo Lui-Kay and his classmates shared them with their own students and descendants. It is hoped that by introducing these concepts in the west, it will help to preserve the rare and unique teachings of grandmaster Sum Nung for future generations.